This is the third Kazuo Ishiguro book that I've had the pleasure of reading. Last year, Never Let Me Go made it to my personal list of best reads, and The Remains of the Day, another one of Ishiguro's more popular novels, also with a film adaptation (like Never Let Me Go) to prove it, left its mark on me, albeit not in the way that Never Let Me Go did. Both novels propelled their author into favorite-dom in my book, and I couldn't wait to get my hands on another Ishiguro novel. And so imagine my happiness at having been gifted with a copy of A Pale View of Hills by my book club buddy, Angus, last Christmas. It was meant to be my first read for 2012, but something else caught my attention at the time. But here I am, with hardly a wink last the other night, in my desire to finish reading it and find out what Ishiguro has got up his sleeve this time around. 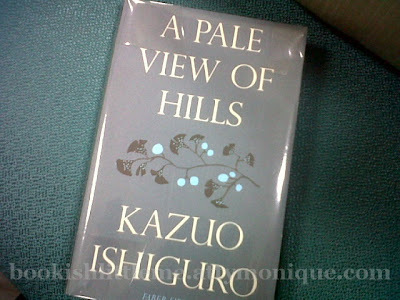 Reading A Pale View of Hills reminded me once again why I love Ishiguro's works. The pace would usually start out slow, continue on in the same manner, in some parts even bordering on dull and boring, but you just have to keep at it until something actually happens. I would even daresay the plot would meander and appear to be heading in no particular direction, but really, it isn't like that. For some people, this would be quite a turnoff, especially to those who prefer clean, definite paths to the story, or who prefer their mysteries solved very neatly in the end. This style, however, which I've now associated exclusively with Ishiguro's works, never fails to take me for a loop. To Ishiguro's credit, he knows how to sustain a reader's interest, dropping little hints at every chapter's end or leaving something suspenseful to look forward to in the next chapter, just to keep you reading. That's always what happens with me, at least. For me, Ishiguro is a master at storytelling; I was completely absorbed with A Pale View of Hills from beginning to end, and I just couldn't wait to get to The Big Twist. Another thing that I love most about Ishiguro's writings is the fact that he will leave the reader to formulate his own conclusions, to challenge his recollection of everything that he has previously read and connect it to the ending presented. If you've read Never Let Me Go and was totally appalled shocked not expecting and affected by the ending, and you felt the need to reread the book just to see if you can pick up clues along the way that seemed pretty mundane when you first read about them, then that's the way it was with this book. As I closed my copy, my mind automatically went on rewind, plucking bits of information and scenes I read about in the previous chapters that even remotely suggested that this was actually how things were in the end. My mind drew complete blanks. My copy: a Faber Firsts TPB from Angus. Thank you! ANGUS: No pressures, really. I prefer to relish Ishiguro's novels, read them with long intervals in between.